The Social Care Institute for Excellence (SCIE) is working on behalf of the Department of Health to collate resources that prove useful in practitioners’ work in relation to mental capacity. To that end I am coordinating a response from STEP comprising useful practice materials that will be provided to the SCIE. STEP’s ‘Clarity on Capacity’ event in early September highlighted several key themes that should be addressed to generate best client service in cases of diminished capacity – one of which was knowledge sharing. In the spirit of sharing to help clients suffering diminished capacity, I encourage STEP members and practitioners associated with the Mental Capacity Special Interest Group to share best practice materials (be they guidance, online tools or other helpful resources). The deadline for submissions to STEP is Wednesday 5 November with the final collection of documents placed on a dedicated website for wide access. Diminished capacity poses an ongoing challenge for practitioners and significant stress for clients and their families; sharing practice material now could benefit them in the future. 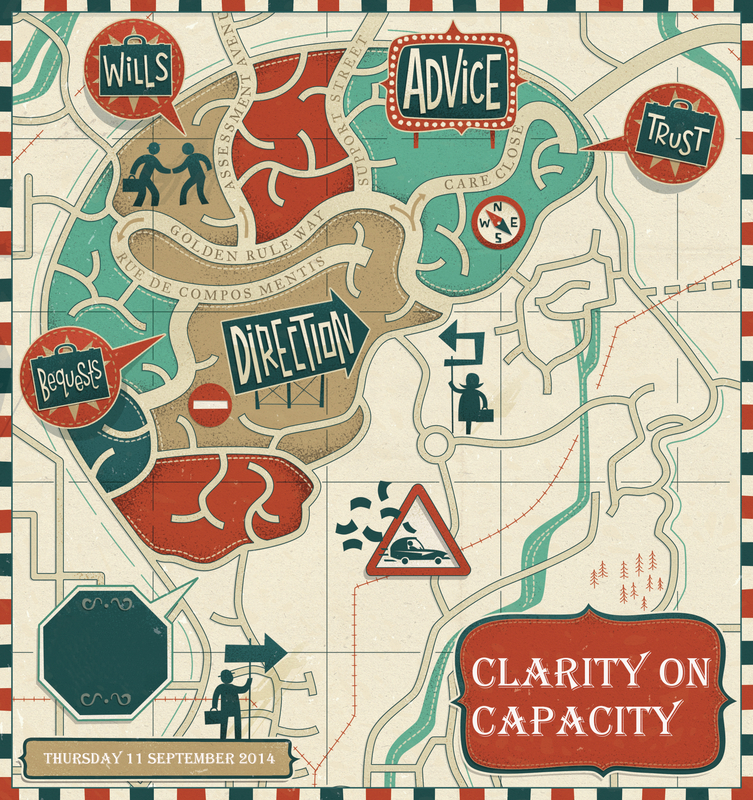 In London on 11 September 2014, over 80 practitioners, including both legal and medical professionals, came together to discuss the issue of testamentary capacity at the sold out event ‘Clarity on Capacity’, hosted by STEP’s UK Practice Committee in conjunction with the Mental Capacity Special Interest Group. Following on from an article in the March 2014 STEP Journal which illustrated how recent court cases had provoked debate as to the suitability of the ‘golden rule’, ‘Clarity on Capacity’ examined the duties of will writers to ensure that all reasonable steps have been taken to satisfy themselves that the testator has testamentary capacity. The event also explored how to reduce the risk of a will later being challenged on grounds of capacity. The day comprised a mixture of presentation, panel debate and group work, beginning with an introduction to the capacity assessment tool being developed by the Mental Capacity Special Interest Group, which aims to assist will writers in ensuring practitioners deliver a robust assessment of capacity. During the panel discussion, leading experts debated topics ranging from the interaction between the Mental Capacity Act (2005) and Banks v Goodfellow (1870) to the practicality of securing timely medical advice in relation to capacity assessments. Much of the day was devoted to a workshop format, with groups discussing questions related to best practice, collaboration with the medical profession, retention of evidence, appropriate charges and costs, and validity issues other than capacity. Medical and will writing professions need to work together more effectively. Suggestions from attendees as to how this could be achieved included joint qualifications/training from STEP and relevant medical bodies. Delegates also spoke about the need for a simple way to locate qualified medical practitioners in their local area, with charges for services clearly outlined. Practitioners would benefit from practical guidance in a number of areas to ensure best practice and consistency of approach. For example, guidance to ensure comprehensive note taking. Another suggestion was guidance from the medical profession so that will preparers were more alert to the potential medical issues of clients. This chimes with the issues raised in a recent STEP webinar in which James Ward TEP and Dr Nori Graham of Red and Yellow Care discussed fluctuating capacity, particularly when the client experienced intermittent capacity without an overt change in demeanour. Practitioners should communicate with each other to share experiences and best practice. In addition, in developing its guidance, STEP could learn from collaborative actions taken by other sectors, for example, the Pre-Action Protocol for Disease and Illness Claims. Through sharing their experiences and insights, all participants contributed to delivering a successful ‘Clarity on Capacity’ event. This spirit of collaboration is essential to address the key themes that came out of the event and ensure the needs and wishes of clients are met. Tired of surfing for the latest private wealth industry news? Welcome to the wrap-up of the top ten most popular stories in the STEP Wealth Structuring News Digest throughout September. In case you missed them, here are the worldwide industry news stories most viewed by our readers. Citizenship renunciation fee soars as American expats flee FATCA: US government fees charged to Americans for renouncing their citizenship will rocket from USD450 to USD2,350 on 12 September. The fivefold increase is probably related to the recent dramatic rise in renunciations triggered by the US Foreign Account Tax Compliance Act. Ten banks withdraw from US amnesty: It is reported that ten Swiss banks that joined the US Department of Justice’s non-prosecution programme have now withdrawn from it because they have decided they did not systematically break US tax laws. The agreement entails paying a large fine and disclosing client information to the USDoJ. Cayman wealth advisor jailed following IRS sting: Investment advisor Joshua Vandyk, formerly of Cayman Islands firm Clover Asset Management, has been jailed for 30 months in the USA for offering to help conceal clients’ funds in anonymous offshore accounts. His Miami clients turned out to be Internal Revenue Service agents pretending to be bank fraudsters. Clarification regarding registration in Model 1 jurisdictions: The US Internal Revenue Service has clarified that non-reporting financial institutions do not generally need to register for the Foreign Account Tax Compliance Act if they qualify as deemed-compliant or exempt in a jurisdiction with a Model 1 inter-governmental agreement. There are some exceptions. US prosecutors allege tax evasion conspiracy: The US authorities have charged six Belize business executives with organising a scheme to help American citizens evade USD500 million of taxes, escape their reporting obligations under the Foreign Account Tax Compliance Act, and manipulate US stock exchanges, all through anonymously owned shell companies in Belize and Nevis. Industry chief condemns UK ownership registry plan: Jersey Finance’s chief executive officer Geoff Cook has published a detailed criticism of the UK government’s plans for a public registry of beneficial owners. Rumours of big bank merger: Swiss newspaper SonntagsZeitung reports that Credit Suisse and Bank Julius Baer have been holding informal merger talks. Renunciation may not be the answer: A US tax expert describes some of the difficulties faced by American expatriates who renounce their citizenship to avoid the Foreign Account Tax Compliance Act. He suggests they first make use of the Internal Revenue Service’s voluntary disclosure programme. Country-by-country reporting approved at G20: The UK and 43 other countries have committed to implementing the OECD’s new country-by-country reporting template, forcing multinationals to disclose where their profits are made and whether they are shifted elsewhere. Worshippers recant in droves over capital gains tax blow: Thousands of German churchgoers have defected from their congregations over a new government policy of collecting a 9 per cent capital gains levy direct from their bank accounts. Church members have always been charged the tax, and from 1 January the banks will begin collecting it at source – but have only just told their outraged customers. Summer might be over but there’s still plenty going on in the private wealth sector and you might need to catch up on the big industry news stories. Welcome to the wrap-up of the top ten most popular stories in the STEP online Digests throughout September most clicked by our readers. Amendments to intestacy and reasonable provision rules: The rules of intestacy change this week, with the coming into force of the Inheritance and Trustees’ Powers Act 2014 on Wednesday 1 October. The Act could also make it easier for some cohabitants to make a reasonable provision claim under the Inheritance (Provision for Family and Dependants) Act 1975. HMRC provides updates on automatic reporting rules: HM Revenue & Customs has created a new web page to keep practitioners updated on reporting issues for the US Foreign Account Tax Compliance Act and its other international agreements for automatic information exchange. It has also published new guidance on the FATCA implementation regulations, albeit with only minor amendments. Rawlings solicitor’s insurers must pay all costs: The insurers of a negligent solicitor have been ordered to pay all the costs of both parties in the Marley v Rawlings contentious probate case. The solicitor had drafted mirror wills for Mr and Mrs Rawlings but inadvertently allowed each to execute the other’s will. Opening of market to accountants ‘will cut fees by a third’: Accountants who offer probate services could undercut the standard solicitors’ fee by a third, according to one of the firms preparing to enter the market. Another attack on trusts: It is difficult to see the UK government’s proposed ‘settlement nil-rate band’ as anything other than the latest assault on trusts, writes Martyn Gowar. Second homes reclassified as businesses to save council tax: Owners of second homes are increasingly reclassifying the properties as holiday lets in order to avoid council tax and take advantage of the current 100 per cent small business rate relief. HMRC guidance clarifies meaning of ‘professionally managed trust’: According to tax advisors Baker Tilly, HM Revenue & Customs’ new guidance on the US Foreign Account Tax Compliance Act makes some things clearer for trustees of UK family trusts. For example, the trust will be classed as professionally managed (and thus need to register as an investment entity) where trustees have appointed a financial institution to carry out the day to day functions of the trust or where the financial institution manages the financial assets and manages the investment strategy. Labour Party announces mansion tax plan: The Labour Party has promised to introduce an annual wealth tax on high-value property if it gains power in next May’s general election. The Liberal Democrats have already committed to a similar policy. Death benefits tax regime to be eased: From April 2015, a defined contribution pension fund left by someone who dies before they turn 75 can be passed on to anyone as a tax-free lump sum even if it was already in drawdown. For a person dying aged 75 or over, the tax on a pension pot left as a lump sum will be reduced from 55 to 45 per cent, or alternatively the pot can be passed on as a drawdown fund.